A full field of 14 two-year-old fillies went to post in the $2 million Grey Goose Breeders' Cup Juvenile Fillies (G1), at 1 1/16 miles on the main track. My Miss Aurelia was sent off as the 2-1 favorite, undefeated in 3 starts including the Adirondack (G2) at Saratoga and the Frizette (G1) at Belmont last out. 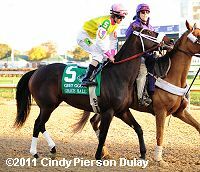 In to challenge her included 7-2 Grace Hall, winner of the Spinaway (G1) at Saratoga and the Blue Hen at Delaware, and 5-1 Weemissfrankie, winner of the Del Mar Debutante (G1) and the Oak Leaf Stakes (G1) at Santa Anita. Jockey Martin Garcia sent 9-1 Candrea to the lead first time past the stands and she set an opening quarter in 23.20 and half in 47.19 while stalked by My Miss Aurelia. On the far turn, My Miss Aurelia took over the front, through 3/4 in 1:13.08. Grace Hall, 8th early, put in a strong late rally but to no avail as My Miss Aurelia cruised to a 3 length victory in a time of 1:46.00 over the good main track. A long 6 length gap separated Grace Hall from third place finisher 5-1 Weemissfrankie third. My Miss Aurelia wins the Juvenile Fillies. Left: My Miss Aurelia in the winner's circle. Winning jockey Corey Nakatani said, "She broke really well. My main concern was getting her in a good spot so I had options to go outside, or inside, or to the lead. Actually, she put herself in just the right spot. It's great to be connected with Steve and (assistant) Scott (Blasi). They give you a lot of confidence when you ride." 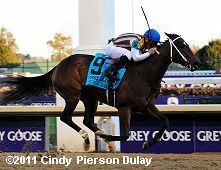 Trainer Steve Asmussen added, "She's extremely special. How proud we are that she's a homebred (for Stonestreet Stables), and that George (Bolton) bought into her as a yearling. She's been everybody's pick at every stage, and she came through today with a great race." Right: My Miss Aurelia returns to the barn after the race. 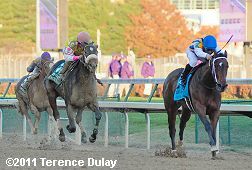 Trainer Steve Asmussen added, "She's extremely special. How proud we are that she's a homebred (for Stonestreet Stables), and that George (Bolton) bought into her as a yearling. She's been everybody's pick at every stage, and she came through today with a great race." Co-owner Barbara Banke, widow of breeder jess Jackson added, "It's been a rough 2011 for me and for my kids, two of whom are here.� We decided that maybe it was more like we were just going to declare a year end and go forward.� So it looks like we've turned the corner, and this is a good omen of things to come. I'm very happy to have the homebred My Miss Aurelia win this race, and the kids are happy.� It means a lot to us." Left: Second place finisher Grace Hall in the post parade. 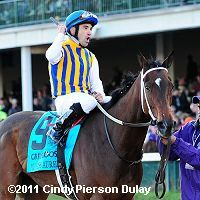 Her jockey Ramon Dominguez said, "I tried to get to the winner, but she was a little too much for us. She's been doing great, galloping strong. I was very pleased. She ran great. She settled for me, and I had a beautiful trip. 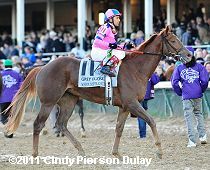 I wasn't very far off the pace horse (Candrea), maybe four off the lead, she just couldn't outrun the winner." Right: Third place finisher Weemissfrankie returns afte the race. Her trainer Peter Eurton said, "It was a little rough on the first turn, but as it turned out, down the backside, we were in good position. But the track appears to be a speed-favoring track, and she didn't get a hold of it well. Being third is no disgrace. I'm very proud of her."